There are some things we do, knowing full well that we are not going to feel that great afterward, but are still compelled to take part regardless. The Fancy Food Show is that for me. My love of food and geekiness about the latest, coolest, most interesting edibles being produced, keeps me going year after year. It is also totally gross. A massive example of food waste, over-consumption, capitalism and desperate marketing. But there are gems to be found amidst the flashy trash, and it is the detective in me that loves a good hunt. And despite the inner voice telling me to remember how completely stuffed I feel after hundreds of tiny little bites, I keep biting. Still, even if I gained 5 pounds in 3 hours I may have had the most fun this year. I was alone. No one else’s agenda, no meeting times or scheduling issues or appointments…and no toddler pulling on my legs or yelling “no” into my ear. Just me and my notepad and the search for some favorite new things. BLANXART has won my heart for a long time. I can’t get this brand of amazing Spanish-made chocolate here in Santa Cruz, so my friend brings it to me when he visits from SF. The type that I have always preferred is their organic dark, 72%, which, despite the high cocoa content, has a hint of that creamy, sweet scalded milk flavor of the best hot chocolate you’ve ever had. But now, I have been introduced to their new line of single origin bars, from various growing regions, all packaged beautifully with a map and cocoa content percentage. 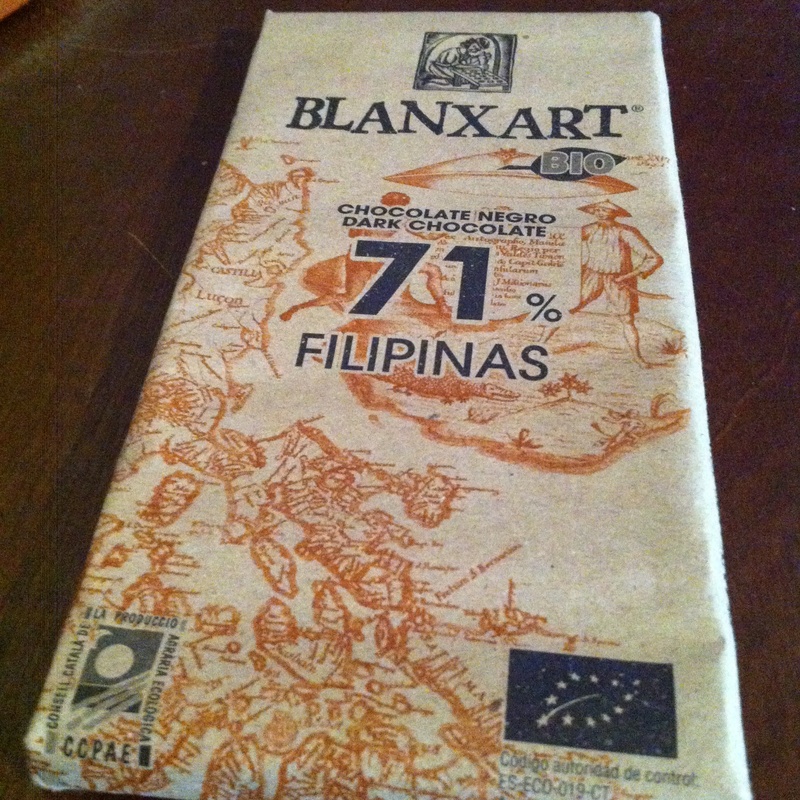 I had never tasted chocolate from the Philippines, and it turns out that it is pretty rare. But there are a small amount of growers bringing the cocoa crop back to life after a history of clear cutting and Blanxart snatched some up to feature in their new line. POK POK SOM is an example of a trend I’m seeing lately that I’m really liking. It is actually a really old concept, known as “shrubs” or drinking vinegar, it is generally a fruit juice base with some tang from vinegar or from a slight fermentation and a bit of sweet to round out the flavors. It has health benefits associated with it and offers a myriad of mixing potential for cocktails, but great just by itself too. 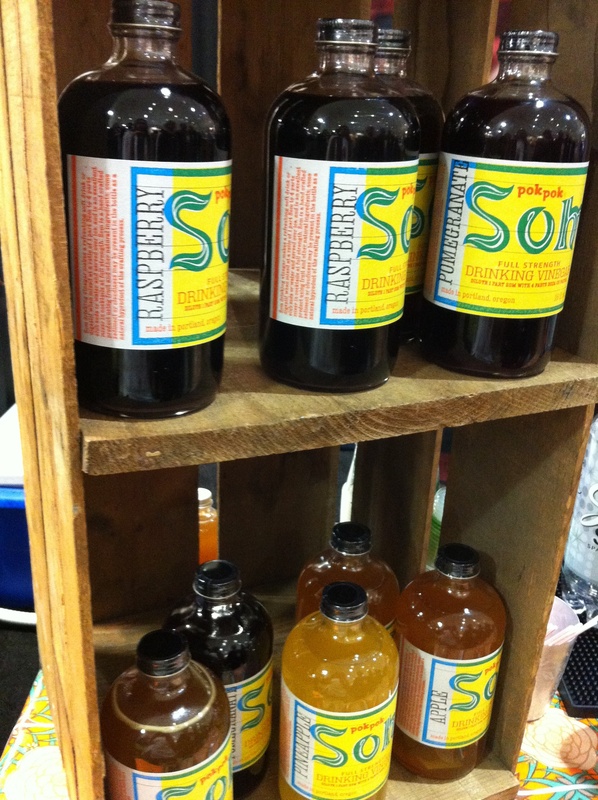 Pok Pok, the amazing Thai food empire that began in Portland by James Beard winning chef, Andy Ricker, has launched this Som line in bottles that are available online. I really liked the Thai Basil and the Pineapple flavors. SNIP CHIPS are made so close to me and I never knew it! The popularity of Kale chips and the conviction that we are eating something ultra nutritious even if they are covered in grease, has found a new outlet in this veggie chip line. But these are actually really healthy. Wonderfully Raw, the makers of the equally good Coco-Roons (sweetened with maple syrup, not Agave nectar which is being debated now as a highly refined, unhealthy option), combine “passion for pure ingredients and a healthy way of living, we sourced our ingredients from around the world supporting the wild, organic and sustainable movement”. 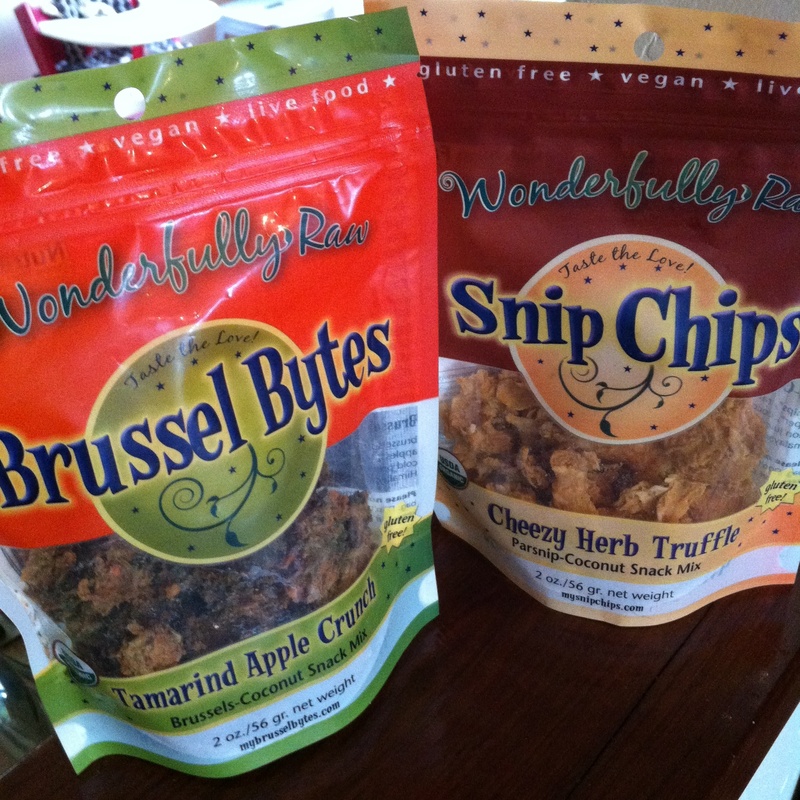 That means that the “Cheesy Herb Truffle” chips that I tried are made up of parsnips, raw coconut, raw cashews, red bell pepper, coconut nectar, basil, rosemary, lemon juice, truffle oil, nutritional yeast and Himalayan crystal salt. They are crisp and satisfying, low in calories and high in health. I also love that they are taking not-so-popular produce and making it shine. 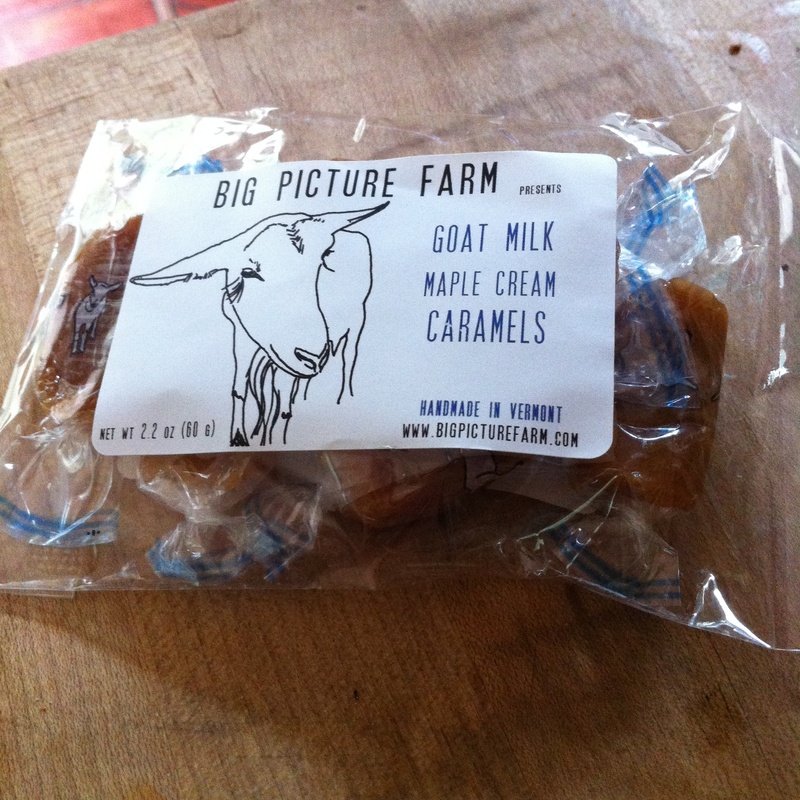 GOAT MILK CARAMELS from Big Picture Farm are really good. What is also good is seeing a really high quality, small-scale producer getting such acclaim. The “Vermont goat dairy and farmstead confectionary” was awarded the coveted Sofi award last year and a Good Food Award this year. It is run by a cute young couple with their 30-something herd of goats and a strong mission about ecology, provenance and purity of flavor. And their design savvy draws you in immediately, with whimsical sketches of the goats sprinkled on each one of their products. And those were just the stand-outs! I sampled more chocolate than you can imagine, like Neo Cocoa’s Almond Butter Smoked Sea Salt Truffle or Claire Square’s “Sow Your Oats” Caramelized Oat Chocolate Bar. There was popcorn in every conceivable flavor combination, one of my weaknesses. Some weird Italian company called Pregel, who manufactures frozen desserts, were handing out brioche stuffed with gelato and then grilled…the hot cold ooze was hard to resist. But some really outstanding ice cream producers stood out as well. Steve’s non-dairy variety using decadent coconut cream was amazing, as was the new company, Choctal, who are making crazy delicious single origin chocolate and vanilla ice creams. The Palestinian Rumi Tree Olive Oil was great and the Halo seaweed chips were weird but strangely appealing. What always seems to happen at this time of year is a mad race from garden to kitchen to jar. Nothing ever slowly or gradually ripens and awaits harvest. Instead, we go from eager anticipation to complete overload in what feels like a few short weeks, and end up with a long counter full of bowls and baskets and crates heaped. They cry out to not be wasted, to not let the toil of seed to start to fruit be for naught. And so, needless to say, it’s canning, jamming, drying and preserving season. I just canned some pears out of this necessity. Our tree dropped all the fruit at once, and we scrambled to get them all off the ground before the animals grabbed them up. They ripen off the tree, so over the course of a few days, despite our best efforts to consume them rapidly, the big bowl of pears were yellowing and softening way too fast. So now that bowl is condensed into two quarts of halved fruit in light syrup. A delicious winter night’s treat to come. However, I ended up with excess syrup. The ratio was only 1:8, using a half cup of sugar to four cups of water, since the pears were so sweet on their own. I also ended up with one lonely half pear, too big to force into the packed jars. I hate to waste anything (my philosophy at large is to repurpose over throwing out in most situations), so I put the leftover syrup, the half pear and a small stick of cinnamon into a jar and stuck it in the fridge to deal with later. Put lots of ice into a cocktail shaker. Add Bourbon and pear syrup and shake vigorously. 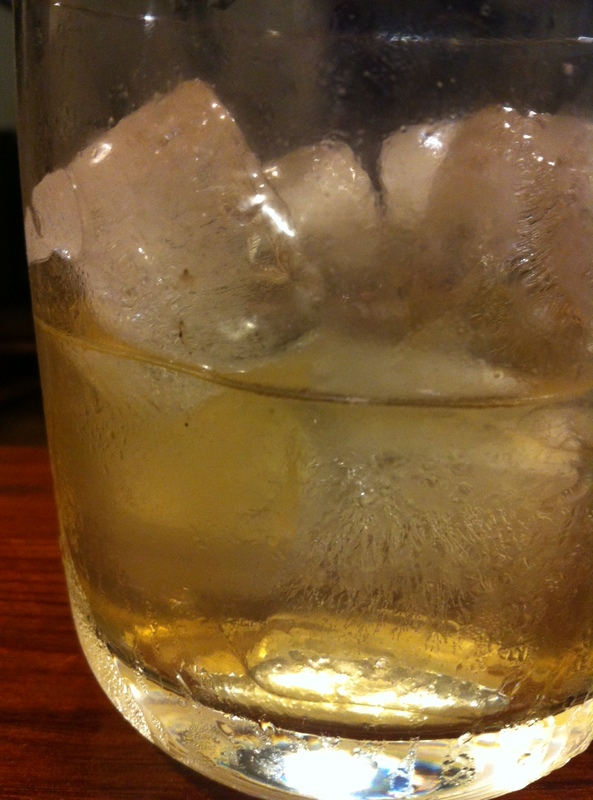 Add ice to a glass, preferably pre-chilled, and pour Bourbon mix into it. Drip a few drops of bitters on top. Garnish with a dried pear slice if available. Enjoy! We go to a lot of potlucks. And lucky for us, most of the time there is a pretty diverse selection of food that arrives in the arms of our cohorts, friends, neighbors and the like. Of course there is the occasional dinner of tortilla chips, salsa and apple pie, but no one seems to complain…I, for one, totally vote yes to apple pie for dinner anytime. And usually the next event’s bounty makes up for the imbalance. But there is certainly an art to potluck fare, and perhaps some of us just innately understand that and some don’t. Rule number one is to bring something. Rule number two is to bring something that you have made yourself that has some flavor…salt and seasoning are good things. And rule number three (there can always be more rules, but I’ll limit my potluck regulations here to three) is, in the event of a time shortage that makes it necessary for you to just pick something up at the store on your way, make it something interesting. Don’t just bring a bag of chips. Why not a good cheese that you haven’t tried before with some fancy crackers or seasonal fruit? Or if the drive from the store isn’t too far, what about bringing some ice cream and a package of cones? That would probably make you the most popular person of the day. Being a baker, my mind wanders to a dessert contribution upon accepting a potluck invitation. But I also tend to desire simplicity and ease of preparation. Most of us don’t have the time, energy or inclination to devote to making multiple stepped recipes for a potluck, and why should we? That’s the beauty of the potluck, to allow for equity of labor so that we can have fun on a random weeknight. It’s about community and sharing a meal, not slaving over something to prove your skills and make yourself stressed out. Save the gateau de crepes for a really special occasion. I’m so happy to have found not one, but two new cake recipes in the last month that are perfect for potlucks, or really for any impromptu purpose. They both are easily adaptable to any season since they feature fruit and come together with just a few ingredients that you most likely have lying around. 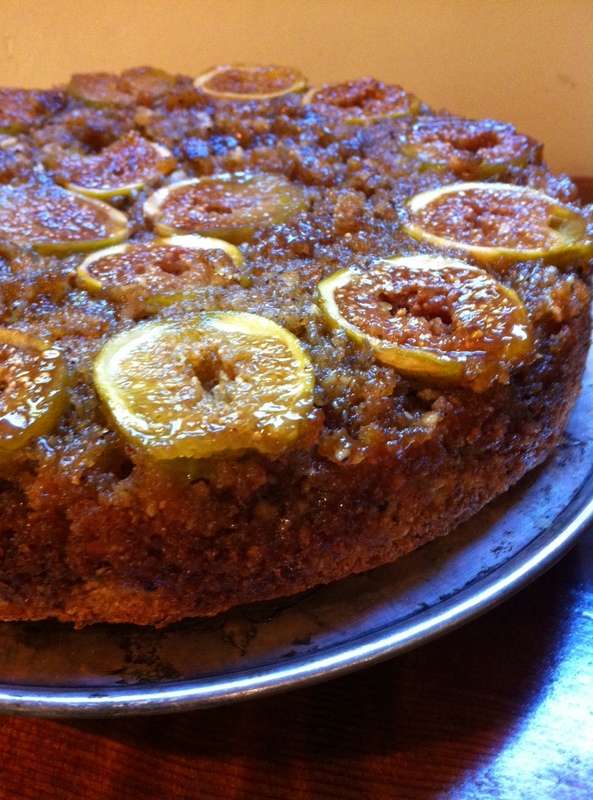 The first is an upside down cake, originally using ground almonds and apricots, but I’m envisioning pistachios and figs or even ground coconut and pineapple. I made it for my daughter’s first birthday using hazelnuts and figs and it was pretty great. Us grownups topped it with whiskey spiked whipped cream. The second cake, actually called a Kuchen, is an easy two-egg base that can be topped with pretty much any cut up fruit. I swayed from the original plums and subbed in pears and it was awesome. Cherries, peaches, anything would be great. And what I love best about both cakes is the room for seasonality. I look around at the heaping bowls on the counter and decide from that. “Use it up!” I say! Upside-Down Hazelnut Fig Cake for Hazel’s First Birthday! Preheat oven to 325F. Grease a 9-inch cake pan. Scatter the brown sugar on the bottom of the pan, patting it into a thin, even layer. 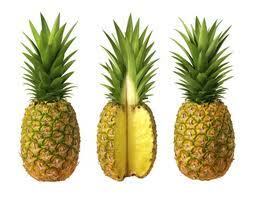 Arrange the fruit, cut side up, in concentric circles until the pan is filled. In a bowl or mixer, cream the butter and sugar. Add the ground nuts until combined, then the eggs, one at a time, beating well after each addition. Add extracts. In a small bowl, stir together the flour, baking powder and salt, then fold into the egg mixture just until blended. Pour the batter over the fruit arranged in cake pan. Spread evenly, being careful not to disturb the placement of the fruit. Bake for 45-55 minutes or until the top is golden brown and firm to the touch, beginning to pull away from the sides of the pan. Cool 10 minutes, then invert onto a serving platter. Serve with whipped cream or ice cream if desired. Preheat oven to 350F. Grease a 10-inch spring-form pan. In a large bowl, cream the butter and sugar until smooth. Add the eggs, one at a time, then the sour cream or yogurt and extracts. In a small bowl, stir together the flour, salt and baking powder, then fold into the egg mixture just until combined. Spoon the batter into the prepared cake pan. Arrange the sliced fruit in a spiral, starting in the center and moving out, to cover the surface of the cake. Drizzle the lemon juice and sugar, then dust with cinnamon and dot with the butter bits. Bake until the fruit releases its juices and the cake is browned on top, about 35 minutes. Cool well before removing from the pan. Serve with whipped cream or ice cream if desired. Serves 6-8. 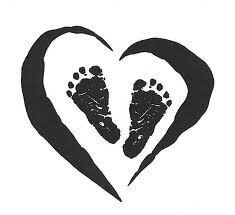 Of all the life changes that having a baby brings on, perhaps the most pivotal is that it makes you examine what would happen to this new little being if you were suddenly gone. Our own mortality is abruptly mirrored back to us with the entrance of offspring, so some of us sign up for life insurance, talk about creating trust accounts, or set up legal documents and wills. I think that to truly take care of our children and create a stronger sense of security, separate from the paperwork and bureaucracy, parents need to take care of themselves first. And there is no better time like this fresh season to start. Luckily, we have Rebecca Katz’s newest book, The Longevity Kitchen , to guide us. 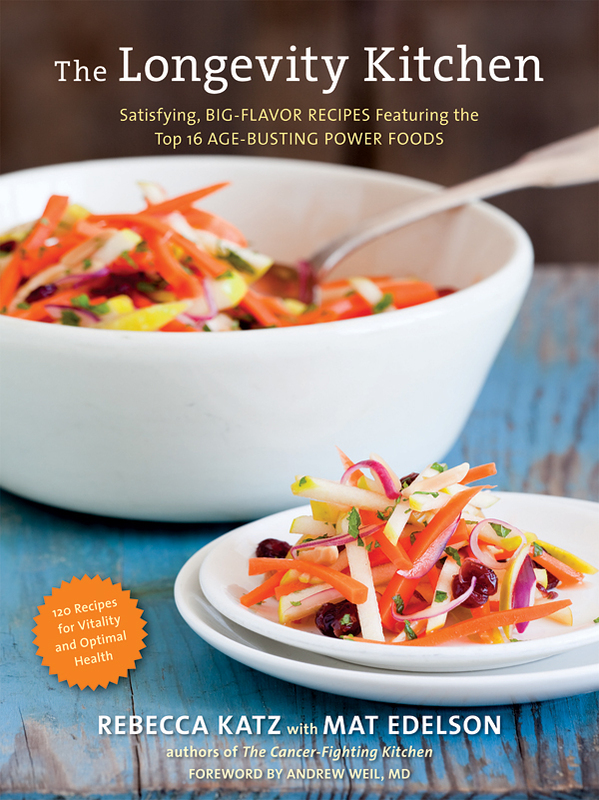 The Longevity Kitchen is not a sensationalized, trend-centered tome on the latest superfood. It does not preach extreme cleansing programs or offer strict dietary regimens, nor does it make huge exclamatory claims about losing weight or solving every problem you’ve ever had. Instead, Rebecca Katz, known for her reputation for blending culinary sensibility with nutrition knowledge, has put together this latest collection of recipes by simply following the theory that real food is good for you. Her co-author, medical writer Mat Edelson, fills us in with the facts, proving that our dietary choices can heal or hinder. With a culture that is currently overwhelmed by obesity, type 2 diabetes and similar lifestyle related illnesses, this book suggests some refreshingly grounded and positive ideas towards cooking for health. In a time of crisis – the vast majority of Americans no longer know how to cook – Rebecca’s book is literally a lifeline to longevity. It meets readers wherever they are along the cooking/nutrition spectrum. That’s the key to creating a rapport. The delight in these pages is that for those who just want to eat delicious and healthy food, any recipe in this book will accomplish that. But inevitably, that first encounter will draw you in deeper. After reading and using the book myself, someone who is already pretty used to being in the kitchen with whole foods, I couldn’t agree with Dr. Weil more. The 100-plus recipes are centered around 16 “power foods” that are ingredients some of us can easily access and possibly already do: asparagus, avocado, basil (and in the same family, mint), blueberries (plus other dark berries), coffee, dark chocolate, garlic, green tea, kale, olive oil, pomegranates, sweet potatoes, thyme, walnuts, wild salmon and yogurt. Katz then discusses the importance of how whole foods are “team players” and should be eaten accordingly. My only critique is that even a brief point about the controversy surrounding cooking with olive oil should have been addressed. There is so much confusion about whether or not heating olive oil causes cancer and/or strips its nutritional value, that it begs at least a sentence or two, especially since it is the cooking oil called for in all of the recipes. For someone like me who generally picks up a cookbook and flips right to the recipes (or, more accurately, straight to the back to look at the desserts), I would definitely recommend not to do that in this case. Weil’s foreword, the Introduction and the first three chapters do a really good job delivering the book’s message. After absorbing this information, I honestly felt like I wanted to eat better, and was that much more ready to delve into the recipes presented to me. I specifically loved The Culinary Pharmacy section in Chapter 2, which listed the nutritional and health benefits of ingredients alphabetically from Allspice to Yogurt based on the latest research from over 500 studies. This drives home the point that a huge diversity of whole foods are good for us, and presents a lot more options than the primary sixteen that the recipes are based on. Chapter 2 also provided an interesting and clear-cut look at what each recipe in the book is particularly good for, health-wise. For instance, the delicious Sweet Potato Bars that I chose to make for a dinner party are listed under the Stress Reducers and Blood Sugar Regulators headings. I also made Maple-Glazed Brussels Sprouts with Caraway, and now I know that combination of ingredients makes them the perfect Immune Boosters. Chapter 3 offers similarly useful and interesting content. The “Culinary GPS Quiz” helps us assert our own personal approach to food and what we are really seeking when we eat, cook and embark on healthier lifestyles. An important note on using organic ingredients is included as well, suggesting we look at the Environmental Working Group’s annual “Dirty Dozen and Clean Fifteen” list to determine what to steer clear of if organic is not an option. There is also a nice section on “Global Flavorprints,” which breaks down regions of the world by common ingredients for easier improvisation in the kitchen and reminds us how beneficial spices and herbs are. It is also a nod to our diversity and proof of a common thread, discussed in the book as well, that our grandmothers way of cooking is what we need to channel–a time before so much packaged and processed foods took their toll. The element that makes The Longevity Kitchen a good cookbook and not just a health book is Chef Katz’s attention to flavor. She reiterates that if something doesn’t taste good, we will not adopt it as part of our lifestyle, so we might as well make healthful food delicious. It makes perfect sense, and she is really great at creating recipes with flavor in mind. Her discussion of FASS (fat, acid, salt and sweet), in this case, olive oil, lemon juice, sea salt and Grade B maple syrup, explains that there is a balance in well-crafted dishes that speak to our whole mouth. For a person who may be entering the kitchen timidly, this is much needed guidance that is often left out of other cookbooks, and is perhaps the formula for success in eating for a healthy, long life. 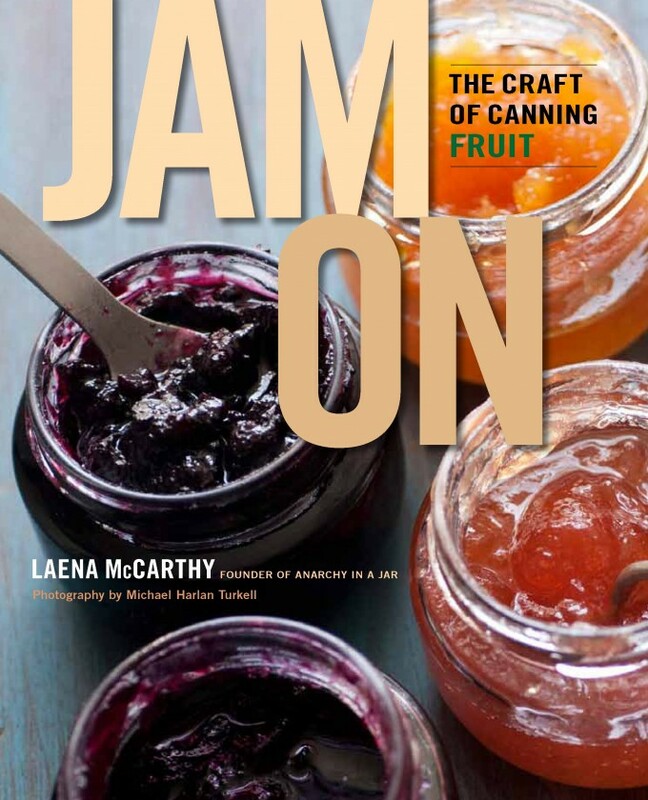 Before Whole Foods, Martha Stewart and Anthropologie got wind of Anarchy In a Jar, Laena McCarthy’s jam, jelly and preserves company was simply a way to put her passion into practice. She grew up watching her mom can food, and then in college, made the connection between those early impressions of DIY sustainability with a new curiosity for food politics. A botched batch of strawberry jam eventually led to launching her own company in 2009, amidst what McCarthy describes in her new cookbook, Jam On, as “a food-production renaissance blossoming in Brooklyn.” Perhaps it was luck, as she says, or perhaps her key to success is her innovative ingredient combinations, sourcing directly from small farms, or choosing to recreate recipes with less sugar than usual. What began as a revolutionary idea against the norm, to share with the public pure, concentrated, clean flavors, is today flourishing from coast to coast. Although somewhat ironic, from “anarchy” to popularity, the wide approval is a heartening sign that the consumer is primed for knowing more about where their food comes from. And in this case, that food happens to be quite delicious. The book, Jam On: The Craft of Canning Fruit, is a wonderful example of organization, simplicity and consistency in terms of lay out. Each of the eight chapters (except for number one, which is “Laena’s Story”) begins with an informative introduction, explaining the recipes ahead, then lists the recipes in an index before launching into the step by step instructions for each. At the bottom of each recipe there is a “Tips” section that discusses appropriate pairings and suggestions for serving. Along these same lines, a whole chapter at the end is dedicated to pairings, offering a variety of savory and sweet dishes to prepare that feature the book’s previous ideas. A little bit of humor and/or regionalism is mixed into many of the titles, a nice flair to accompany the unique flavor combinations, such as “Love Me in the Morning Heart Eggs with Grapefruit and Smoked Salt Marmalade and toast,” “I Eat NYC Hot Pepper Jelly,” “Thai Me Up Jam” or “Big Apple Butter”. Most importantly, chapter three, “Get Your Jam On: The Step-By-Step Guide,” is a must read before jumping into the book regardless of your skill level or previous capacity in canning. McCarthy breaks down the steps involved into simple and easy to follow numbered sections, debunking many myths (no one ever told me that you didn’t have to use a rack at the bottom of your hot water bath or that you could stack jars on top of each other while boiling!) and offering in-depth explanations to the reasons behind some of the more mystifying elements to jam-making. Perhaps it is her formal academic background in science that lends to such clarity about pectin, sugar content, temperature and experimentation within the boundaries of safety. That emphasis on experimentation is really what sold me on this cookbook in particular. I have a hard time following a recipe word for word, as I generally tend to cook based on what I have on hand and what inspires me at any given moment. It seems that McCarthy works this way as well, and as a result, has included at the back of each chapter a section entitled “Make It Your Own.” Every recipe has a list of alternative additions or substitutions along with proportions to re-create one of her original recipes into something that might be more fitting to your palate or your pantry. This makes working with Jam On pretty fun, offering guidelines to ensure positive results but lots of wiggle room to play. I chose to tackle the Meyer Lemon Marmalade because I have a tree dripping with the fruit right now. Following the lower sugar, less cooking time method that McCarthy adheres to perhaps creates a few more steps, such as boiling apples to make a “juice” (mine came out more like an apple water) and then adding some of the pulp and seeds of the juiced lemons to the cooking jam to contribute their natural pectin. I also ended up having to juice way more lemons than the recipe indicated, but that could be based on the size of mine versus hers. The addition of bay leaf and absinthe is what made this marmalade stand out, but I could have easily subbed in whiskey and cardamom, brandy and sage or sake and lemongrass per her suggestions to suit my taste…all equally as unique and impressive as a gift idea. With all of the lemon peels left over, I chose to make candied citron as a by-product. I’m somewhat surprised that McCarthy didn’t suggest this herself, as a candied citrus peel recipe is actually included in the book and would have been a fitting, practical idea to offer for this particular recipe. I’m still having fun with Jam On and intend to refer to it throughout my holiday edible gift crafting. I’ve already procured some of my friend’s home-brew beer to use for the Spiced Beer Jelly and I’m already looking forward to making Rhubarb and Hibiscus Jam or the Tart Attack Shrub with rhubarb and lime come spring. If you have never made your own preserves before but really want to get going, this is a great book to try. But even if you feel like a pro and rarely look to guidance while putting up your bounty, this is also a great book to try. The fact that a single book can cater to that kind of range in experience while upholding a high level of innovation is truly impressive. A jar of homemade jam and a copy of Jam On might be just the ticket this holiday season. This review was originally posted on Civil Eats. I just harvested a baby. 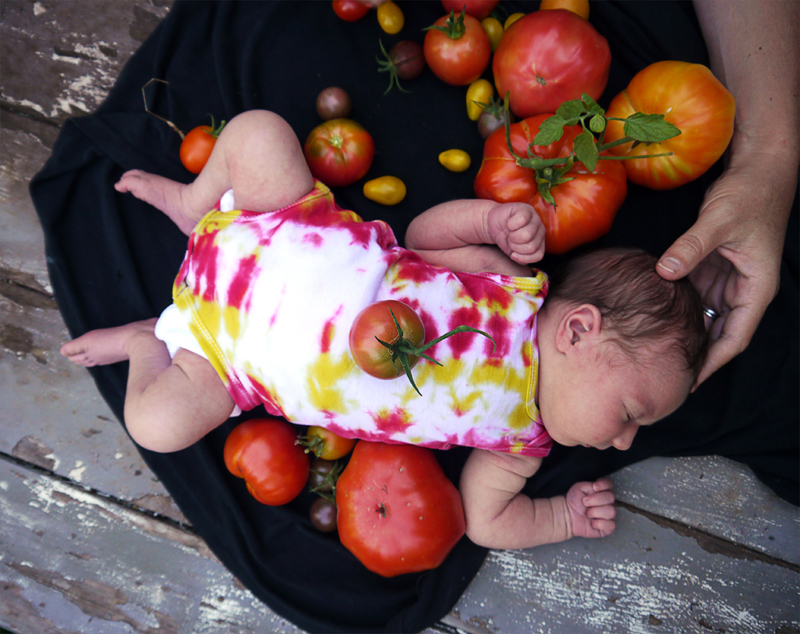 Picked after 40 weeks plus five days of ripening, she weighs in at a whopping 9 pounds, 1 ounce and stretches 21.25 inches long. Her genus is Sonial Stimpson, but commonly referred to as the “Hazel” variety. There really couldn’t be a more perfect example of her species, and we are tempted everyday to just eat her up! Preserving her takes a lot of preparation and work, though. And unfortunately there isn’t really a recipe for success…mostly trial and error to get it just right. We are two weeks into the testing phase, preliminary research and development did not provide comprehensive guidance into the project and we are working overtime to say the least. Lots of sleepless nights, but all worth it. In fact, the brevity of this field note entry is a testament to our time constraints and level of activity poured into putting up Hazel. I’ve learned by now that caffeine doesn’t adequately fuel the energy needed for this type of work, and can have disastrous secondary effects on the specimen. However, highly nutritious fuel is required to keep the project moving forward. The following recipe, with room for adaptation to suit anyone’s preference, has proven to be a great start to each day. Preheat the oven to 300F degrees. In a large bowl, combine the oats, coconut, dried fruit, nuts/seeds and salt. In a small saucepan over low heat, melt the butter (if using). Stir in the sweetener and remove from heat. If using oil, mix in a small bowl with sweetener. Add the vanilla (if using) and pour into the dry ingredients, stirring well until everything is combined. Whisk the egg white in a small bowl and add, stirring well to coat. Divide the mixture between two rimmed baking sheets and spread into a thin layer on each. Bake, stirring occasionally and then re-spreading evenly, for about 30-40 minutes or until deep golden brown. Rotating the pans is a good idea to ensure even baking. Remove from the oven and press down with a spatula. Let cool completely before transferring to an airtight container. Makes about 8 cups. I’m 5 months pregnant. Actually, in baby speak, the language they communicate in here in the land that I suddenly find myself in, that’s referred to as 20 weeks pregnant. It is quite an experience, has its ups and down’s as any woman with child will tell you. And as my first crack at it, I have to say that I am astounded every day that something so scientifically magical can take place pretty much without intervention, at least when all goes well, thankfully. My body keeps rolling along, expanding and stretching and creating a little life that will pop out in a few months like a cake hot from the oven. Which brings me to the point of all of this: FOOD. I can, with all honesty and confidence, tell you that my relationship to food has always been a strong one. My work, my life, my self is intertwined in the subject and has been for as long as I can remember. I write about, I make it, I sell it, I eat it, I think about it all the time. So when something like getting knocked up occurs, silly me assumes that my food self will stay the same as always. I’m healthy, I listen to my body, I eat a very balanced, clean yet delicious diet, so what could change? And why would I need to change anything? Well, things do change, and it has led me to ponder some big questions in a way I never have before. One of the main things I keep running into has to do with cravings. And it’s not at all a cliché to say pregnancy causes cravings. It really does, in a primal, needful kind of way like a wild animal must have. (It also causes really abrupt aversions, so drastic that once-favorite flavors can cause a gag reflex practically overnight). So what happens when a person, let’s say me, who ardently promotes seasonality and supporting local farmers and producers (like my own business), finds herself craving pineapple. So desperately that she has to leave work to go hunt one down. I know it sounds dramatic, but it happens. This brings me to think about moral dilemmas that become less important in the name of nutrition. I must have needed potassium or Vitamin C. Pineapple also is high in fiber and actually contain large amounts of serotonin, according to “The New Complete Book of Food, A Nutritional, Medical, and Culinary Guide,” by Carol Ann Rinzler. The week or two of pineapple gorging that I had was enjoyable, but I kept having this somewhat guilty feeling as I looked at my counter, otherwise piled with seasonal bounty like Oro Blanco grapefruits and Meyers Lemons from our orchard. The Costa Rican Pineapple (it was organic, at least) stood out like sore thumb. And then there was the weird carob craving, despite the suspicion that the “grain sweetened” (i.e. : malted barley and corn) carob covered almonds I was wolfing down were not organic and most likely contained GMO ingredients, not to mention the soy lecithin, which is a whole other topic. I’m actually not a crazy, uptight, hyper-vigilant person. I acknowledge that you can never avoid everything harmful or know how to fix everything. I don’t live in a prison of restraint or try to preach it to others. But when you do know certain things, about food additives and politics in this case, it is hard to let yourself go blind to it, especially when you are consuming the very same “bad” thing for two. Yes, I could have maintained stronger willpower and breathed through the cravings, but then I would be ignoring an important voice that my body was literally screaming at me to obey. Another issue I have come across has to do with food restrictions. Every pregnant woman in America has been told to avoid certain things. Mainly, the list consists of unpasteurized cheeses and dairy products, caffeine, a wide variety of fish (and never raw), and alcohol. We take all of this as scripture, baffled that there was once a time when doctors advised you to limit your prenatal martini intake to only two at cocktail hour. How many of our parents came out just fine, relatively speaking? And I’d love to see some statistics about how many French women refuse to eat genuine Camembert for nine months, or Japanese women who bypass their daily fish diet. What about all the female winemakers or relatives of them, in any of the hundreds of winegrowing regions across the world? (Seriously, if anyone finds stats on this stuff, send it to me…). I’m not disregarding the proven hazards or nutritional research to these dietary recommendations; I’m just bringing up the extreme black and white nature that is often the standard of western medicine. The point of this diatribe, I guess, is to bring attention once again to trust and intuition. We are all just struggling along in our own little worlds, navigating through life the best we can. The importance lies in letting ourselves listen to ourselves, trusting that our decisions will guide us, and not getting lost in the quagmire of information that is hurled at us every single second in this day and age. So let yourself eat a tomato in Maine in January if you absolutely need it (remember that it won’t taste very good though) or order a milkshake knowing it isn’t organic once in awhile. Just listen, and come back to yourself. 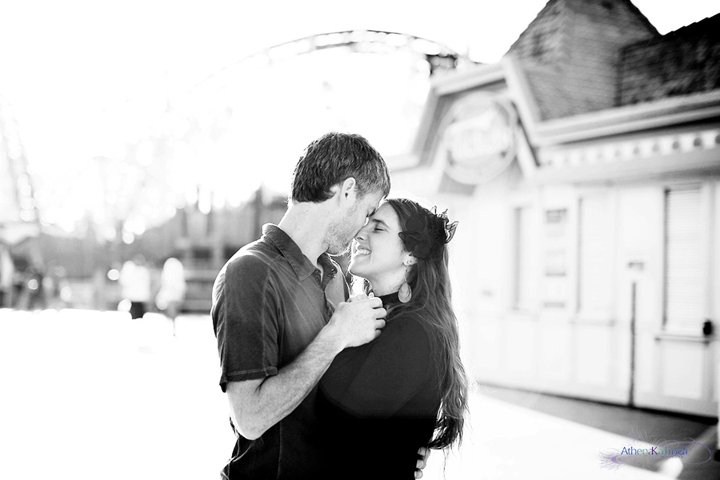 Well, this post is going to be extremely short because…we are getting MARRIED on Saturday! It is crazy how time flies by. So anyway, we just wanted to reach out one more time before the big day with a couple of small details. If you are arriving from out of town on Friday, please feel free to stop by The Tyrolean Inn (9600 Highway 9, Ben Lomond, CA 95005) for a drink. We will be there for our rehearsal dinner and would love to see anyone and everyone in the Beer Garden following our meal. On Saturday, the ceremony starts at 3pm at the Alba Road Schoolhouse (12070 Alba Road, Ben Lomond, CA 95005), followed by lots of delicious surprises! We can’t wait to see you all. Sunday, we will be opening Filling Station (1500 Mission Street, Santa Cruz, CA 95060) just for you! Swing by for breakfast at Fran’s (The Truck Stop) and coffee at the shop. We will be there from around 10am until we have to leave to pack for New Orleans! It should be a beautiful weekend and we are so excited to share it with you. Open Studios – A huge array of artists from both sides of the county take part in this widely popular annual event. You can purchase a guide from the Cultural Council or just look for the bright green signs that indicate where an artist is showing their work. Santa Cruz Beach Boardwalk – Needs no introduction. Fun for all and nothing really comes close to the kitchy nostalgic strangeness of one of the only authentic boardwalks left. 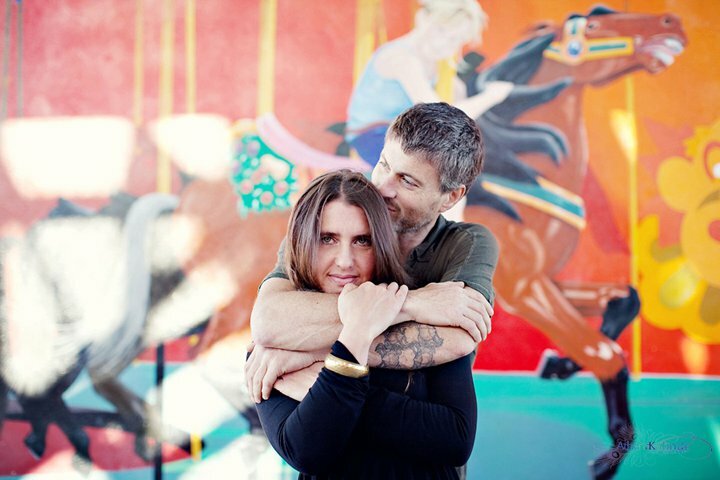 Oh, and our friend Athena took some great engagement photos for us here (see above), so we like it a little bit more now. Santa Cruz Mountain Winetasting – Download a map from the Santa Cruz Mountain Winegrowers Association and check out why our area offers such a diverse mix of great wine. We are happy to provide some names of our favorites if you are interested. Quality Inn Ben Lomond – Reservation is under Amber Turpin, call direct and specify that you need to transfer the room into your name. Santa Cruz Experience – Offers shuttle service for events and also group wine tours. Hero Designated Drivers – A great service. Tyrolean Inn – Authentic German food with a wide array of beer served in their outdoor beer garden. There is often a blow up jump castle that the kids love. Henflings – A true biker bar. Cheap drinks, live music, a sunny deck and the thrill of never knowing what might happen. 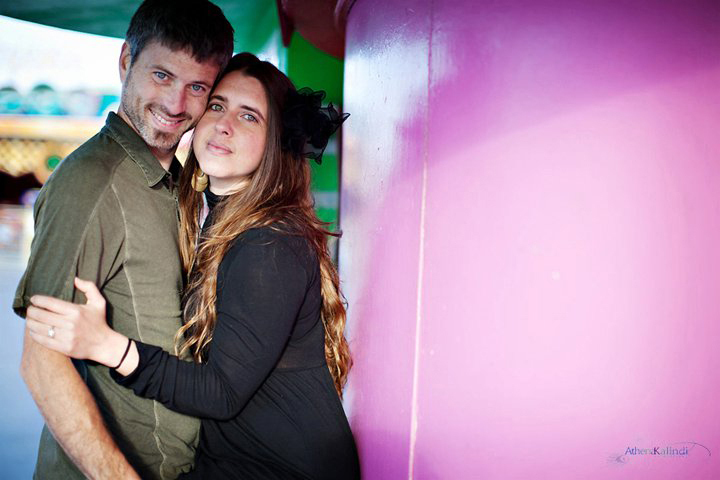 Redwood Pizzeria – A young hippy couple that actually succeeded in creating an eatery that is semi-decent and good for the community. We like the old Palookaville posters and the Santa Cruz Mountain Brewing on tap. Order extra sauce if you get the pizza. New Leaf Markets – This is a small chain of natural food stores that we do most of our shopping at. Our favorite is luckily in Felton, about 3 miles from Ben Lomond. If you havn’t already, please remember to send us your RSVP cards! We need to make sure you all get plenty of yummy food and drink, so let us know as soon as you can if you are planning to come join the party. We can’t wait to see you all and are so happy this occasion will bring us all together. Oh yeah, and by the way, if you didn’t know…we are proud to announce our newest coffee shop venture: Filling Station! Visit us online, on Facebook, or in person if you can. I had seen her from time to time at one party or another. She was quiet and a little sad, and she was beautiful. She lived somewhere else and occasionally visited her good friend and my housemate Emily. At a Halloween party we flirted, though I don’t know if she knew it. Then I hurt my knee and surgery lead to an infection, which almost killed me. I missed Ed and Jessica’s wedding while recovering, more an atrophying, on a single mattress in the living room, and she brought me back a flower. In the haze of Oxycontin and immobilizing illness, while a velvet Marcel Marceau painting mournfully watched me teeter at the precipice of the abyss, I felt a twinge of something, of that one thing. Eventually, I planned an epic adventure; it would be my first out of the house in many months. 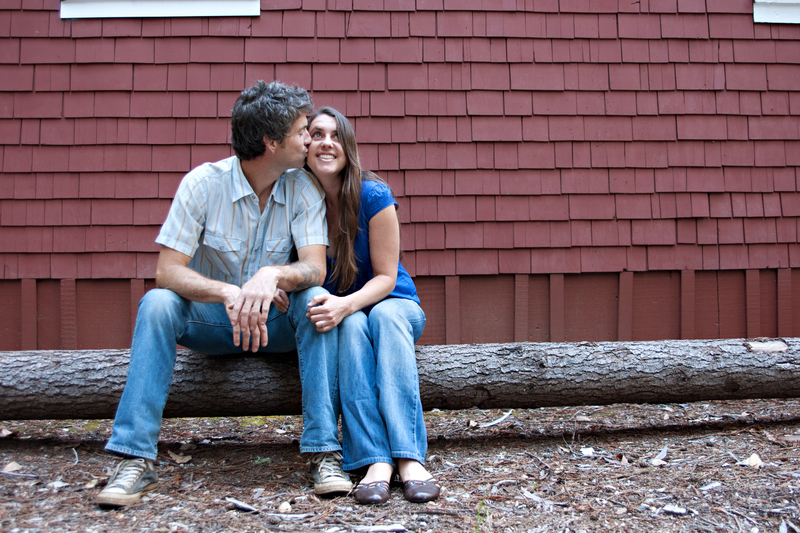 I would show up at her work/living place, a farm, and family camp way out on the Eel River, with an impromptu picnic. I brought beer and wine and bread and leftovers from a Middle Eastern themed dinner we had at the house the night before, and chocolate and flowers. I limped to my truck and headed into unknown territory. Three hours up the 101 and thirty minutes on a winding county road the last of which becomes gravel as it snakes along with the Eel. The drive was beautiful and the hills still held some green, though the fading of summer had begun. The warm air through the window buoyed me and somehow I had no doubts about what I was doing. All was right. The unknown was not scary, but enticing, and exhilarating. There were some guys working near a gate and I asked them if Amber was up ahead and they said yes with a wave. I parked, and with a full picnic basket in one hand and flowers in the other I limped toward voices and kitchen noises. “Do you want to try this chocolate pudding?” someone said. “I like pudding,” I said through a screen door. She was more bewildered than surprised. She wanted to know what I was doing here, I said I was in the neighborhood; I don’t think she got it. Then I asked her to picnic with me. She said yes. She had to finish working, which would be soon, and I could wait in her room/cabin. So with full picnic basket and flowers I limped across the grounds toward her place. To my right a short ways off a large table full of people ate dinner, but as they saw me with flowers and picnic basket limping toward only one possible location, all the accompanying murmuring and clanging of a convivial meal abruptly stopped. In deafening quiet, with dozens of eyes burning into me, I entered her room to wait. Eventually, she finished working, and then she forced marched me up to Inspiration Point, unaware of the still excruciating pain of post knee surgery or my total lack of physical conditioning. We ate and drank and talked for hours. In the wee of night, hand in hand, we walked the farm and toured the barns. She plugged in the party lights hanging from the barn rafters for a magical, fleeting second. I like to think that despite her fear of getting caught at the early morning hour she was compelled to capture a moment. We returned to her room and slept; she on her bed, me on the concrete floor. In the morning, we toured some more, mostly the animals this time, and my all time favorite baby pigs. We said good-bye, and I drove home full of something I had always lacked: Belief. For months we lived far apart, mostly remaining in contact, or rather getting to know each other, by hand written letters sent via the US Mail. Occasionally we meet up in San Francisco or some other bay area locale, often with awkward and certainly drunken escapades. But, probably for good reason, she seemed timid and shy; reclusive, and me, volatile and erratic…a quitter by natural tendency found a way to start something beautiful. It grew slowly, surely, deeply, with ease and fun. We lived the good life for years before we had to weather dark skies and stormy seas, whose waves threw us against jagged cliffs again and again. But eventually those waves bore us away to calmer bays. And so, with this approaching wedding date our story seems to begin again and go on and on and on, like those waves rolling and crashing. If not forever then surely their echoes will be eternal. Contribute to our Honeymoon Fund!